I love my food magazine subscriptions. I love them so much that the shelf under our coffee table is stacked so full that I won’t be at all surprised when it finally slams to the floor under the weight. We keep talking about how I have to go through and get rid of some of them. We’ll probably keep talking about it too. I don’t see it happening any time soon. The true, awful shame in the thing, though, is that I don’t even keep up with them anymore. Each month, I fan out the current issues on top of the table. Most months they sit there looking nice…and unopened. If we’re traveling, I’ll gather up the ones I haven’t yet read and catch up on the plane or train, but that’s really the only time I get around to them. It feels too much like leisure, like self-indulgence, for me to justify sitting down and diving into a magazine when I should be writing, doing dishes, or ironing that damned duvet cover. But I think I’ve found a way to have my magazines back and take that leisure time for myself without feeling like I’m slacking off. I’ve decided to give myself a monthly assignment. When this blog was in its infancy, and I was still figuring out how to cook and bake gluten-free, I adapted a recipe for a Coffee-Chocolate Cake from an issue of Bon Appetit. It was the first recipe I had ever converted and I was thrilled with how it turned out. So I thought, What if I did that same thing every month? What if I made myself sit down, read the latest issue of Bon Appetit and choose a recipe to adapt to gluten-free? It seemed like an all-around win, and it would keep me accountable for something specific and outside of my own head each month, much like participating in the Ratio Rally has. And hey, if you see something in the current issue of the magazine that you would like to see a gluten-free version of, I’ll happily take suggestions. The May issue of Bon Appetit (the first issue of the new Bon Appetit) was all about Italy. By the time I closed the back cover, I found myself longing for gelato in a piazza, espresso in a small cafe, and roasted artichokes in the kitchen of some mythical family that we visit every summer. I more than kinda wanted to move. There were thoughts of changing the name of this blog to GF in la Città. Fortunately, until I manage to inherit a vineyard or something, I get to enjoy the merits of having married into an Italian American family: an excuse to make pasta several times a week, hugs and laughter at every family gathering, and a grandmother that will make two separate batches of eggplant parmigiana so that my gluten-free mother-in-law and I can enjoy it too (she actually made three once: an additional dairy-free batch when my lactose intolerant brother came for the holidays). But I’m going to be honest. There are certain things that I don’t quite understand about east coast Italian American culture. A big one for me is the distinctly un-Italian pronunciation of Italian words (mutzerell, anyone?). Another is the assortment of cookies that inevitably accompanies coffee and dessert to the table post-dinner. I can no longer eat them of course, but it doesn’t feel like much of a loss to me. I just never understood why they were such a big deal; I always found them to be bland and dry. Maybe nostalgia and tradition are a big factor? My Midwestern/Scandinavian upbringing was devoid of the things. Or maybe I just wasn’t eating the right ones? 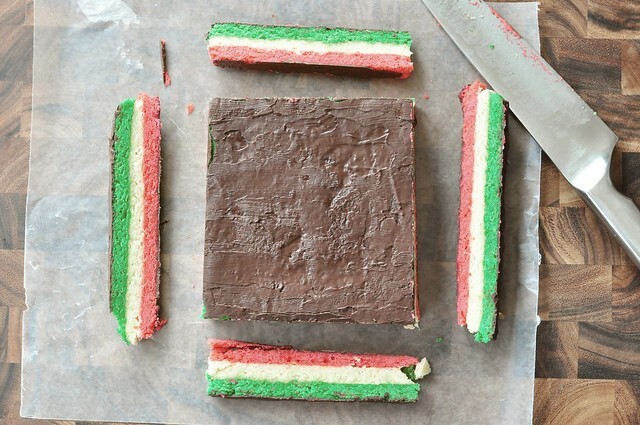 This month’s issue of BA featured a recipe for rainbow cookies. I don’t recall ever picking one out of the bakery box back in the day, but I immediately remembered seeing them jumbled in there with their nonpareil-coated and sticky jam-filled friends. I knew Chris would get a kick out of seeing a homemade version and the deal was sealed when I saw that almond paste was a key ingredient. The recipe produced a cake-like cookie with a fragrant, amandine sweetness. Chris remembers a drier cookie, which I’m assuming had to have resulted from hanging out in a bakery case all day. I can’t imagine that a recipe calling for almond paste and such a quantity of butter could come out dry. I even reduced the butter, increased the baking time, and still wound up with a soft, moist result. After we let them sit out on the counter for the day, Chris felt that they were closer to what he knows, which made sense given my theory. Either way, they were delicious. 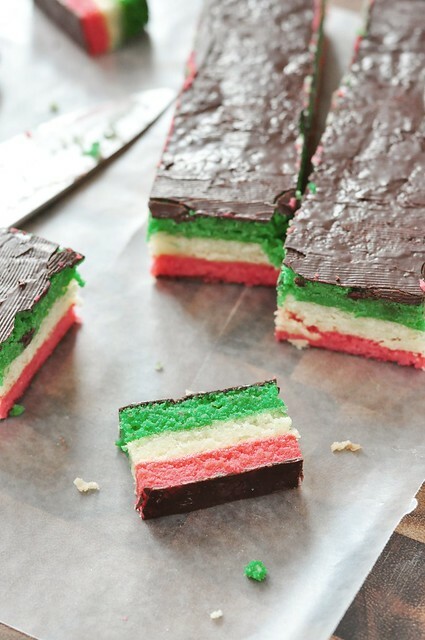 The cookies are traditionally colored red, white, and green—meant to resemble the Italian flag. I took some creative liberties, though, and decided to have a bit of fun with my test batches. 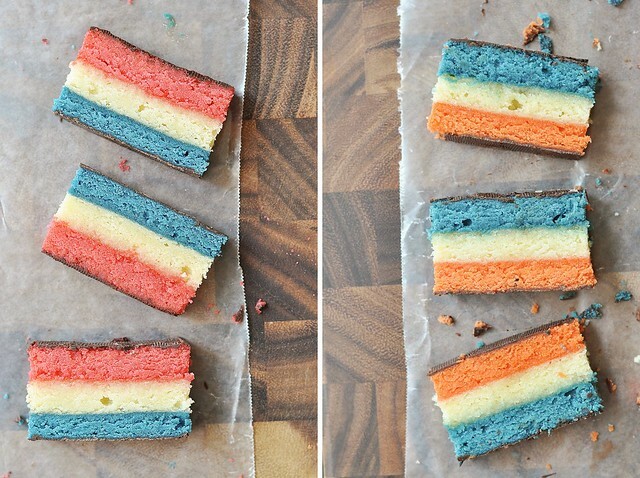 I’m going to be so bold as to declare that these tasty rainbow cookies can be colored to suit whatever occasion you like: red, white and blue for patriotic U.S. holidays (or, you know, if you want to celebrate being French, British, Norwegian…. ), school colors for a pep rally or bake sale, pink or light blue for a baby shower, Tiffany blue for a wedding, or the colors of your favorite sports team. 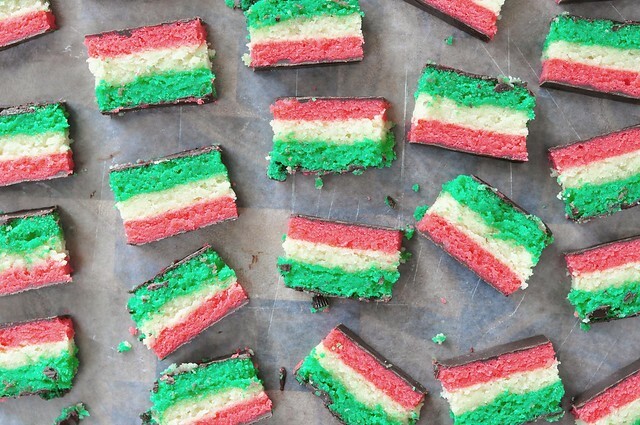 So go ahead and enjoy these treats whether or not you’re celebrating your Italian heritage, eating eggplant parm with the in-laws, or simply catching up on your food mags and daydreaming about expatriation. Seems to me they’re the best in the box. This recipe is much simpler than it looks, but does take some planning ahead because of the downtime. The only catch is that you need to bake three separate cakes, for which you ideally would like to have three separate baking pans. I don’t own three of any baking pan, so I baked my first batch with my only 8×8” baking dish, cooling it off in the freezer in between. It was admittedly tedious, but it worked. If you want to save time without having to add more cookware to your cupboards, buy 3 disposable foil baking pans instead (you still want to line them with overhanging foil so you can remove the cakes easily). I did this the second time around and things went much more smoothly. Regarding the almond paste: make sure to read the label as there is a brand out there that contains wheat. I used Love’n Bake, found at Whole Foods. The ingredients list is clean and their website confirms that it is gluten-free. Preheat the oven to 350 degrees. Line three 8×8″ (or 9×9″) baking pans with a piece of foil large enough to hang over the sides and spray each with cooking spray. In a medium bowl, whisk together the millet, brown rice and tapioca flours, the potato starch, xanthan gum, and salt. Place the egg whites in the bowl of a stand mixer. Using the whisk attachment, beat until foamy. Gradually add in 3 tablespoons of sugar and continue to beat until stiff peaks form. Transfer to a separate bowl, cover, and refrigerate. Rinse out the mixer bowl and wipe dry. Using the paddle attachment, beat the almond paste and sugar together at medium-low speed until combined. Set the mixer to medium high and add in the butter, one cube at a time, beating until fluffy. The almond paste/sugar mixture will be sticky before all of the butter has been added; stop to scrape the bowl as needed. Beat in the egg yolks and add the flour mixture, beating until combined. Remove the bowl from the mixer and use a spatula to fold in the reserved egg whites in two additions. 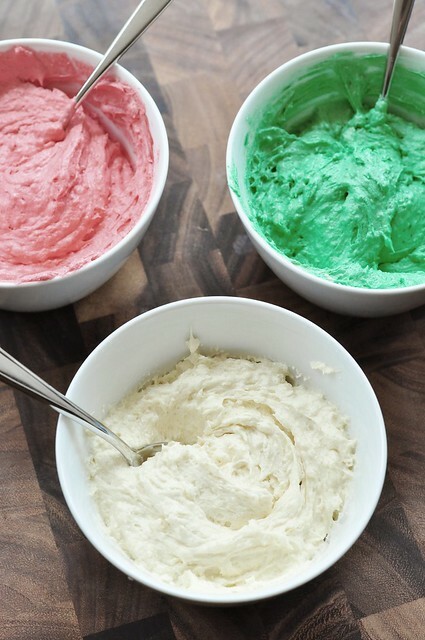 Divide the batter evenly between three bowls. Stir the red food coloring into one bowl, the green into another, and leave the third plain. Transfer each bowl of batter to a separate prepared pan, spreading evenly to cover the entire bottom. Bake cakes for 15-18 minutes, until set (it should not be jiggly or sticky to a light touch). Remove from the oven and cool completely in the pan. Warm the marmalade in a small sauce pan or in a small bowl for 45 seconds in the microwave, just until it’s loose. Pour the marmalade into a sieve and push through into a second small bowl to remove the pieces of orange zest. Brush half of the strained marmalade over the green layer of cake. Using the overhanging foil, pull the plain cake from its pan. Invert it and place it on top the green cake. Carefully peel the foil from the plain cake and brush with the remaining marmalade. Remove the red cake from its pan and place it on top of the plain cake, leaving the foil in place. Place one of the empty baking pans on top of the foil-covered cake layers. Place several full cans or jars on top to weigh the pan down and compress the layers. Refrigerate for at least 4 hours or up to a full day. Remove the cake from the refrigerator and take the cans and second pan off the top. 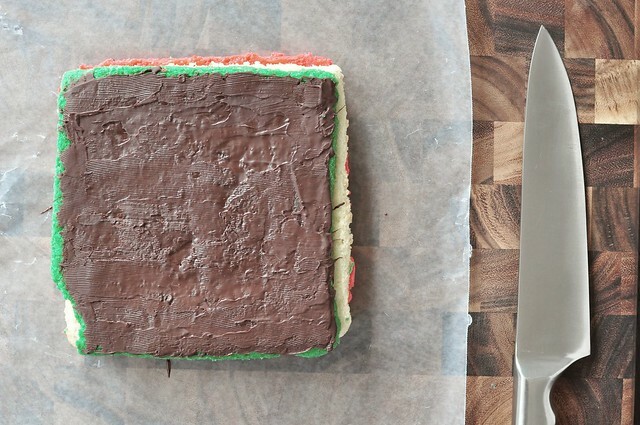 Peel back the top layer of foil and invert the cake onto a baking sheet lined with waxed paper. Remove the pan and foil from what is now the top of the cake. Melt 1 oz of the chocolate chips in a small bowl by either placing it in the microwave at 20 second intervals and stirring in between or placing the bowl over a small saucepan filled shallowly with simmering water (double boiler). Spread the melted chocolate in a thin layer over the top of the cake. Place in the freezer for 10 minutes to set the chocolate. Remove the cake from the freezer, cover with a piece of waxed paper and carefully flip it over (or invert onto a second baking sheet). Remove what is now the top layer of waxed paper. Melt the remaining chocolate and spread thinly over the second side of the cake. Transfer to the freezer to cool for another 10 minutes. Using a sharp knife, trim each side of the cake so that the edges are neat. Cut the cake into thirds. Cut each long piece width-wise at half-inch intervals. Set cookies out for several hours for a drier, more “authentic” cookie, if desired. Store in an airtight container. Disclaimer: Bon Appetit has no idea who I am or that I am doing this series of posts. These adaptations are solely for my own gastronomical benefit and yours.